This is the end, my friend -- of the Beachwood Canyon Loop! The last set of granite stone, cobblestone-o-rama steps, wrought iron railings, and one more nice treat as you leave the enchanted stairs: a cool bottle wall that reminded me of something you'd see at Watts Tower or Grandma Prisbrey's Bottle Village. (It's on your left as you are coming down the steps.) At this point, you've travelled over 2.5 miles and so take your time enjoying the views and hobbling to the finish line! At the bottom of the stairs you will take a right, head down Woodshire until it hits Belden again, and then you'll make a left and head out to Beachwood and, if you time it right, breakfast or lunch at the Beachwood Market and Cafe. 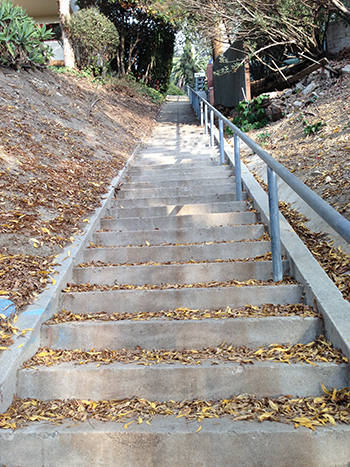 The Beachwood Canyon Loop was like having my own personal fairy godmother that with a wave of her cardio wand was able to grant me my ultimate wish: after 861 stairs, it was my first-ever guilt-free cheeseburger!